Basement walls are commonly damp, wet, discolored, and not esthetically pleasing. Whether a basement is leaking or not, water is still able to pass through the porous concrete, stone or poured concrete wall due to hydrostatic pressure. Moisture passes through the basement wall as hydrostatic pressure builds up behind the paint and causes peeling, flaking and discoloration. Mold can also begin to grow as paint is an organic material. In many cases walls look worse with peeling, flaking, failed paint coating. Basement waterproofing paints can reduce condensation, but they are not a permanent solution to basement water problems. If products have any organic materials, then this environment will become a reasonable environment for mold, mildew, dust mites and rot. Materials like paint, drywall, boxes, cloth and most other common building materials have some organic composition and are vulnerable to these types of damage. Additionally, be wary of absorbent basement wall materials that can absorb moisture as they can also hold water. Waterproof wall panels are semi-rigid waterproof plastic panels that fasten mechanically to the wall. Unlike paint, they can never be pushed off by moisture coming through the wall. The wall panels are installed with special fasteners that are anchored into the concrete wall so there is no adhesive bond to rely on. 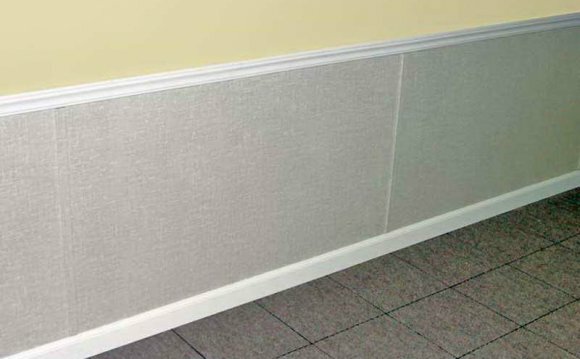 Because the wall panels are 100% waterproof, and have an antimicrobial backing, this helps to prevent mold growth. Any water passing though the basement wall will run behind the panel and drop down into a waterproofing drain tile system under the basement floor. Because the waterproof wall panels are decorative, they will dramatically improve the appearance of the basement. Panels are washable, just like any other surface. Basement waterproofing wall panels and a waterproofing drain tile system is the permanent solution to keeping your basement dry. Homeowners must have a working sump pump with a closed sump basin lid, run a dehumidifier continually, and have their drain tile cleaned at least once a year or more often depending on the soil type. Waters Basement Services installs clean outs in all of our drain tile jobs, so the homeowner may clean it with a garden hose or call us to come and clean drain tile and sump basin.